Writing from the Peak: Updates to June Events! There have been some changes to our movie night and workshop at the end of June (28th and 29th). Don't worry, they're still occurring! We've just made a couple small tweaks. The movie night will now have popcorn and candy available for the donation amount of your choice. Money from this will go to Tri-Lakes Cares, benefiting victims of the Black Forest Fire. RSVP is appreciate, and will gain you early admission to grab a seat. RSVP to rsvp@pikespeakwriters.com. For the workshop, the price has now been lowered from $75 to $25, with 100% of proceeds going to Tri-Lakes Cares. 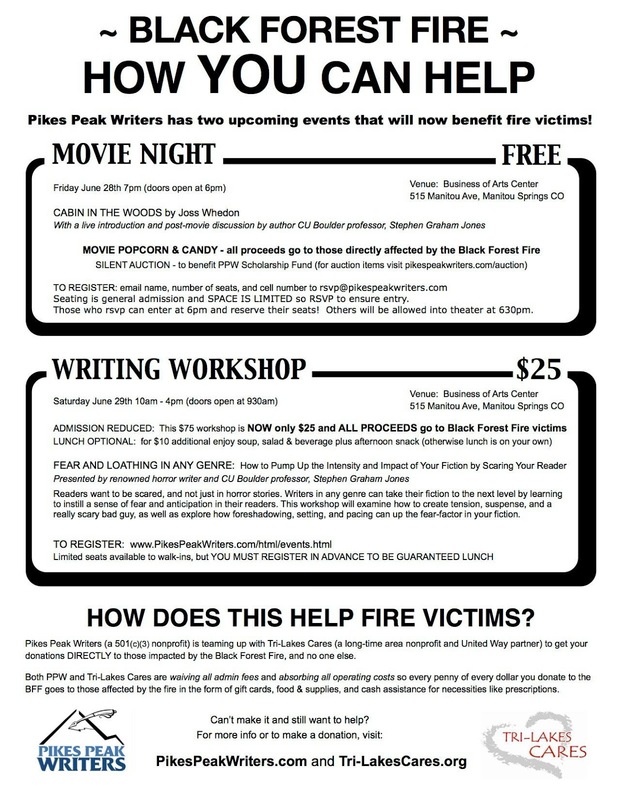 Both Tri-Lakes Cares and Pikes Peak Writers are waiving administrative costs for this and the popcorn/candy sales Friday night, so that 100% of the money will go to Black Forest Fire victims to help as they face the ramifications of the fire. Lunch at the workshop is now optional, for an additional $10. Otherwise, there will be a lunch break so you can find lunch elsewhere, or bring your own. Total cost with lunch is $35. You still register at pikespeakwriters.com, but there is now a pull-down menu to choose the price option you'd prefer. If you can't attend, but would like to donate, you can choose that option, as well. We do need to know in advance if you'd like the optional lunch (soup, salad, bread, beverages, and a snack later in the day), so we can insure enough food is on hand. You can find more information on Tri-Lakes Cares at their website: tri-lakescares.org. If you have any questions, please contact Shannon Lawrence at events@pikespeakwriters.com.